Conquer the mess once and for all. You’ve finally finished binge-watching Tidying Up With Marie Kondo. Now what? Before you go and stock up on Hikidashi Boxes for every cubby, drawer, and dresser, there’s one crucial step to conquer: identifying your weak spot. For some, it’s notoriously tricky pain points like the master closet or that black hole under the bathroom sink that keeps us up at night. For others, it’s the less obvious spaces—like the kitchen pantry or media console. While we all might think we have to fight our tidying battles on our own, the real truth is that there’s always someone out there who’s tackling the same exact mess. In a recent report, Pinterest identified five key spaces that are currently troubling neat freaks across the web by looking at the tidying hacks users are searching for the most. To help put the hunt to an end, we rounded up a few of our favorite organization hacks for each trouble spot. Try: Open baskets, lidded bins, and strong shelves. The kids’ room is the one space where disaster can strike at any moment. Pinterest searches for “Mom organizing hacks” have seen a +143% recently, which might have something to do with all the games, trinkets, and clothes little ones recently discovered waiting under the tree. 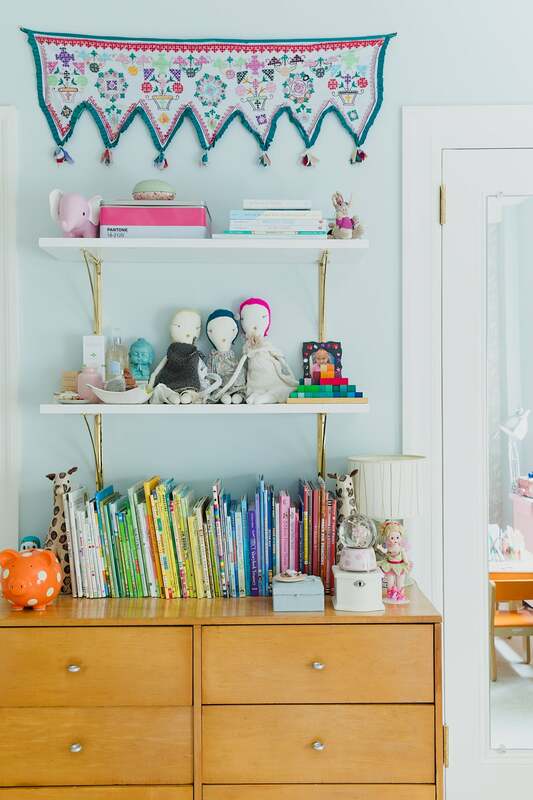 Luckily, the kids’ room also happens to be one of the simplest spaces to clean up on the fly. Think in terms of floor-to-ceiling. While floating shelves are great for more delicate decorative objects and antique finds, bins and baskets can be kept on the floor or tucked away in open cubbies for easy access. Stray for the specifics: organizing by broader categories (books, games, art supplies, etc.) will help keep you sane. Try: Trays, hanging units, and petite bookshelves. Pinners are very concerned about how to store all their post-holiday booze, and we don’t blame them. “Wine rack organization” is at the top of their to-do list. How you organize your home bar depends on your collection. For 10 bottles of vino and under, a standard wine rack that can sit on the kitchen counter or a nearby side table or bar cart is a solid fix. If your ensemble spans wine, liquor, and miscellaneous accoutrements, designate a drinking station in the dining room with a large tray on top of a console table. Stacking booze by category on a small bookshelf or ladder is another eye-catching way to showcase a strong collection. There’s more to the inner workings of a well-organized refrigerator than color-coded food groups. While this is a kitchen sore spot for a lot of home chefs, divvying up space on the doors has proven to be particularly challenging. While labels and acrylic bins are great tools to use in the center of the fridge for veggies, meats, and leftovers, keep this space as clean and clear as possible. Because the fridge door temperature is always changing, use this real estate for condiments and other items that won’t expire quickly. And don’t overcrowd: Air needs to be able to circulate in order to keep items cool. New year, same tiny apartment. We’re always on the lookout for new ways to maximize small and quirky spaces—and, apparently, so is the internet. Searches for “organizing tiny spaces” are up +223% right now. Some of the best design lessons come from studio apartments. Just take Timothy Goodman’s NYC home. A busy gallery wall and bold range of hues first give the impression that the graphic designer’s studio is quite cluttered. But look a little closer and you’ll see how neat it actually is. Clearly a dedicated bibliophile, many of the larger furniture pieces in Goodman’s space pull double duty as storage—like the tiered room divider, which also acts as a mini library. Streamlined pantry space is important for any avid home chef—especially an amateur baker. In the recent Pinterest 100 report, the company noted that searches for “baking” saw a +413% spike. Now those same curious cooks are looking for a proper way to organize their niche tools. Free up precious counter space by keeping hangable gear out of the way on a mounted pegboard. If you’re lacking in counter and cabinet space, stash larger appliances in a rolling coffee cart. For staple ingredients and spices, we’re big fans of switching to a cohesive arrangement of clear canisters and containers. You’ll suddenly start to see things a lot more clearly.